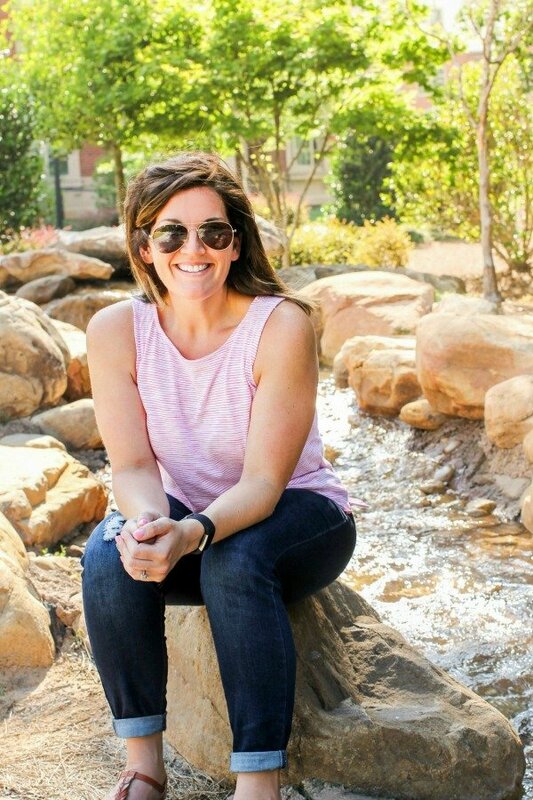 October 12, 2015 By Allyson 14 Comments This post may contain affiliate links. Read my disclosure policy. Y’all…this is one of the recipes that just comes together. I kind of feel like it could be a ‘clean out your fridge’ recipe, because it’s SO easy, and you can use just about any veggies in here. I had stopped at Super HMart on my way home last week, and of course I scouted out their produce. It is always SO cheap, and they have a HUGE variety…can’t beat that. So, when I saw they had the Japanese eggplants for .99 a pound and huge bags of baby bok choy for $1, I knew what I was picking up. As I headed towards the back of the produce section, they have a huge assortment of tofu, and it just so happened they had one of my favorite brands on a buy 2 get one free special – SOLD! 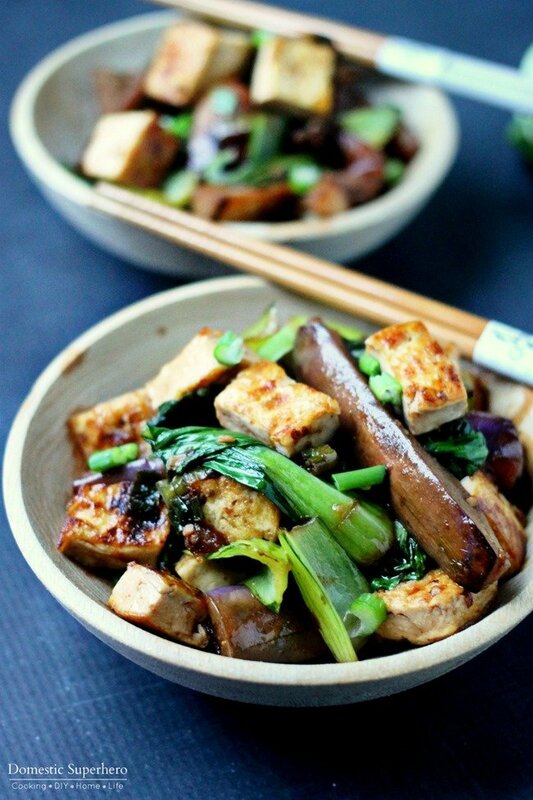 I had made a delicious Asian inspired sauce before, and I knew it would be perfect for these Spicy Asian Eggplant & Tofu Bowls. Now, I know some of y’all see this food and you’re all like, “where’s the meat? !” Well, I am telling you…YOU DON’T NEED IT! The tofu is so thick and ‘meaty’, it totally makes up for it. Hell, even the eggplant is ‘meaty’. However, if you really really really really can’t eat a meal without some sort of meat, then you could definitely add some to this; Chicken, steak, and shrimp would all be outstanding in here. 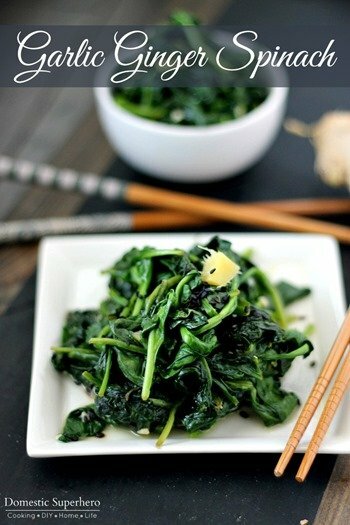 This recipe is also SO easy to whip up…literally less than 30 minutes and so delicious and healthy. 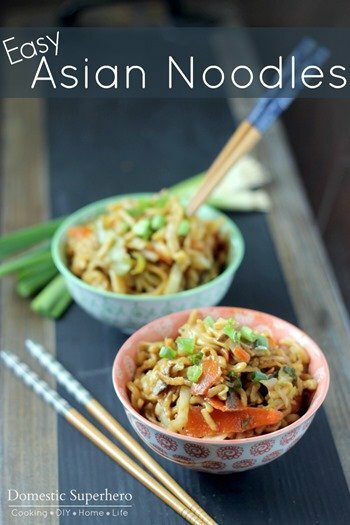 You can add whatever veggies you want, but I enjoyed sticking with the Asian theme. 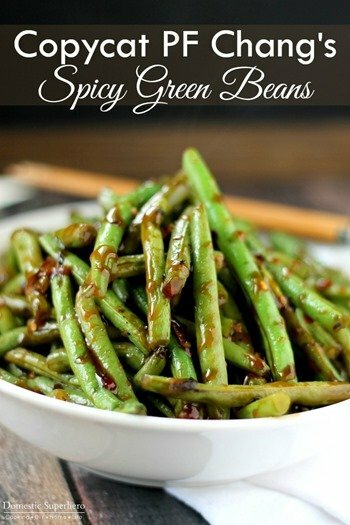 I always order something similar to this when we get Chinese takeout, but I feel so much better eating something homemade, when I know what exactly is in my food. I used a wok to cook up this meal, but if you don’t have one, a skillet would work just fine. I dry fried the tofu, which is really the easiest way of cooking it (no oil involved! ), and then tossed everything together. My husband and I could not stop eating this, it was amazing. Next time, I am definitely going to double the recipe and make some to last throughout the week for lunch and leftovers…so yum! 1. Cut your tofu block in half long ways (so you still have 2 rectangles, but then are half as thick. Place the 2 halves on a folded clean kitchen towel, and place another towel on top of the tofu. Place something heavy, like stacked books or a heavy pot on top of the towel. Allow to sit for 15 minutes to 'drain' the tofu. 2. Cut the tops of the eggplant, then cut in half length wise, and those sections in half again, and again. Then cut them into 2 inch pieces, set aside. 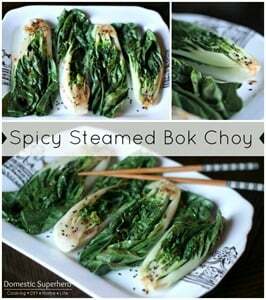 Cut the bottoms off the bok choy, and rinse off the remaining stalks to remove any lose dirt. 3. In a skillet over medium high heat, spray with non stick spray. 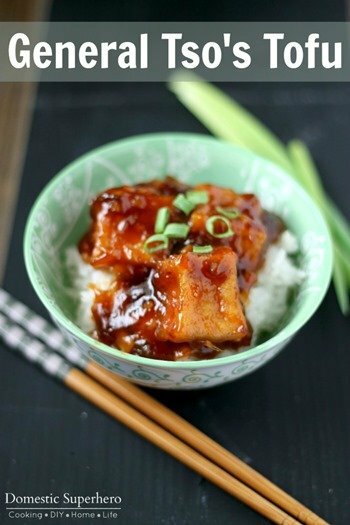 Cut tofu into bite sized cubes and add to the skillet. Cook for a few minutes on each side until the tofu is browned on the sides (I usually only flip once, every side does not need to be browned. 4. While the tofu is cooking, heat 2 TBS vegetable oil in another skillet or wok over medium high heat. Once the oil is smoking, add half the chopped green onions and stir quickly. Add the eggplant pieces and stir fry for 6-7 minutes. If things seem to be drying up, add a couple tablespoons of water to the side of the wok and continue to stir fry eggplant. 5. While eggplant is cooking, mix garlic, soy sauce, water, oyster sauce, sriracha, red pepper flakes, sugar, and sesame oil in a bowl; set aside. 6. 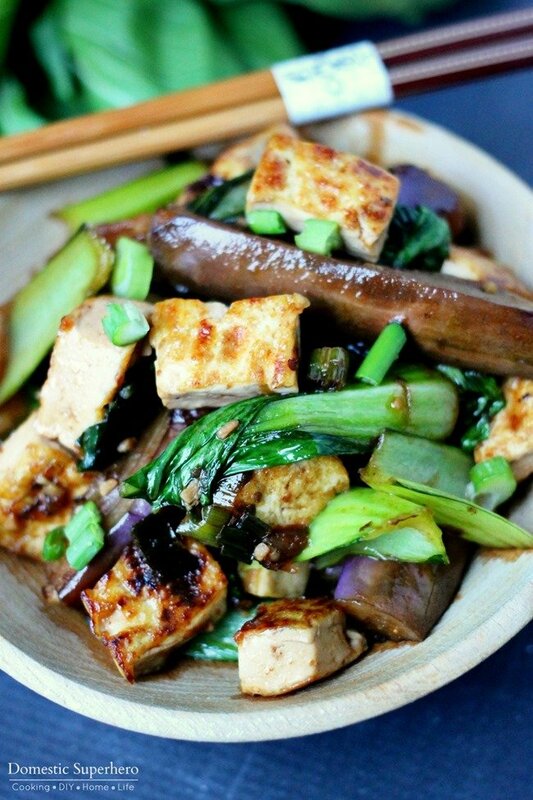 Add bok choy to the wok with the eggplant and stir fry together for 1 minute. Pour sauce mixture into wok and stir to combine. Bring to a simmer, then reduce heat and cook for 2 minutes. Add tofu to wok and stir to coat. 7. 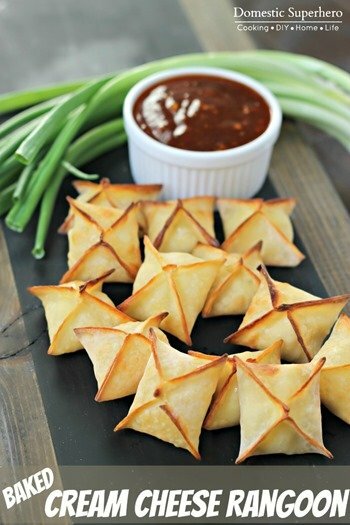 Serve and garnish with green onions. Allyson, this sounds AMAZING! I haven’t cooked with tofu very much but am so excited to try! Yes! YOU MUST! 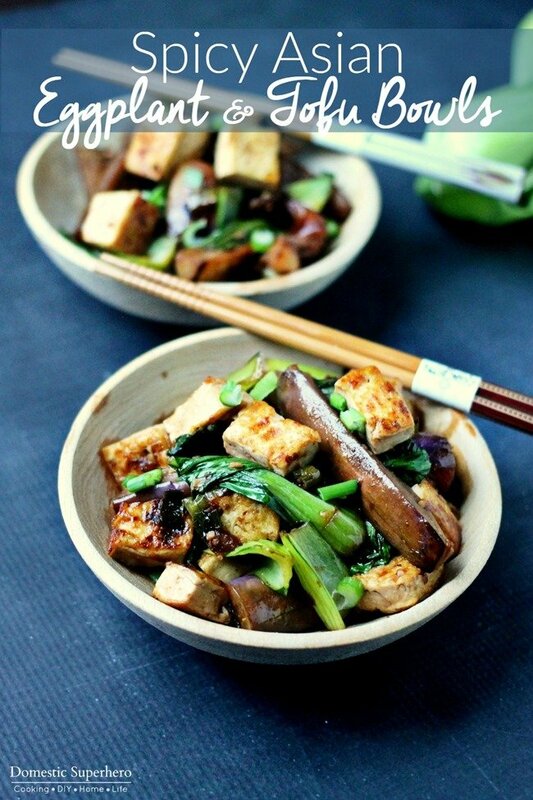 Do not be intimidated by the tofu – it’s SO easy to cook, really! Make sure you drain it well, pressed between 2 heavy objects with some towels, and then just do it! Once you try it, you will never hesitate again! Here’s my take on this recipe: I use Mae Ploy Sweet Chili sauce and Tamari for the sauce. 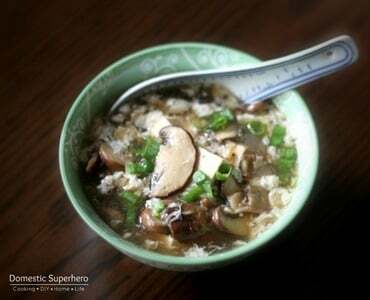 I cut the eggplant and tofu in smaller pieces and bread in Bill’s Best Chik’nish veggie chicken soup powder. I use red and green peppers and onion in my sauce. It comes out just like Panda Express’ version. I cook mine in Thai Kitchen’s Wok oil which has garlic and ginger in it. Sounds great! I will have to try that out! Awesome recipe! I only had one eggplant on hand, so I subbed in a small/medium zucchini for the other. So simple to make and so, so delicious! Will definitely make again. Great sub! I do that all the time too, love some asian zucchini! This is so good! I had chicken instead of tofu, no sriracha, so I used a little chili oil, added shredded carrot and green onion, and thickened the sauce a bit. Served it with rice. Will definitely make again. Thanks! You will LOVE it! So yum!